Individuals in 166 different countries will demonstrate today in People’s Climate Marches to raise awareness about the dangers of complacency in the face of climate change. Critics have long argued that any measures enacted to address the phenomenon will come at the cost of economic growth. 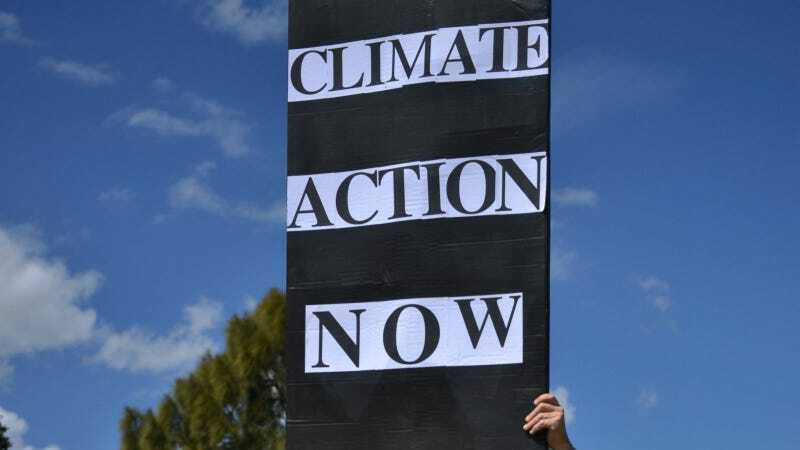 But a study released this week by a coalition of scientists, academics and policymakers argues that the cost of putting the brakes on man-made climate change is minimal — and in the long-run may actually be free. The group, chaired by former Mexican president Felipe Calderón, estimates that the world is going to spend $90 trillion on infrastructure projects through 2030 anyway. Steering those investments toward low-carbon technologies would only add about $4 trillion on net, or less than 5 percent of the original amount. The world could even see net savings from switching to low-carbon power sources like renewables, which the authors argue have fewer operating expenses and longer lifespans than fossil fuel assets. And in the right investment environment — one that recognizes the lower risk profile of low-carbon energy sources like solar and wind — they could also have lower capital costs. The authors’ modelling puts the cost of sprawl at $400 billion a year thanks to more expensive public services, higher capital costs for infrastructure, lower overall resource productivity, and accident and pollution damages. To move forward, they say, we’ll have to revive policies from the age when cities were planned around foot travel, while accounting for modern demands for public transportation. Another, more unexpected task required to limit climate change will be to revive demand for nuclear power. Nuclear is mentioned alongside renewable electricity and carbon sequestration as a triumvirate of technologies that could help slow manmade climate change as long enough investment goes toward them. “Deploying low-carbon technologies including renewables, nuclear and carbon capture and storage (CCS)” would cost the world $4.7 trillion, or only about 5% to the total cost of future infrastructure investments, the authors say. “Several OECD countries have … announced plans to reduce or phase out nuclear power completely, a process that has firmed after the Fukushima accident in 2011,” they write. The U.S. also has some nuclear coming online, but it is less than two years removed from a year in which it five nuclear plants were marked for decommission due to rising costs, especially opportunity costs from missing out on the natural gas boom. “Nuclear offers many benefits in terms of energy security and avoided emissions, but [its] challenges – from waste handling, to high capital costs, to public concerns, are likely to persist,” the authors write. The authors are nevertheless encouraged by the potential for deploying small modular reactors and thorium fuel. Interest in these must ramp up significantly to meet CO2 goals. The two other key components to tackling climate change that the authors mention are the most politically difficult: eliminating fossil fuel and agricultural subsidies, and making CO2 emissions more expensive. OECD countries on average currently receive government incentives worth about $70 billion on average to keep using carbon-intensive fuel sources. Meanwhile, a quarter of all CO2 emissions are tied to land cultivation of one form or another. If countries are serious about climate change, they will have to put those policies in reverse, by taxing fossil fuel use and inefficient farming. The authors are under no illusion about the political barriers to this, and do the best they can to detail feasible measures that can be taken. The report’s ultimate trump card, the one that could help break that gridlock, is the huge economic risk associated with business as usual. The negative health impacts from rising CO2 emissions in developing countries is on average 4% of their GDP, climbing to 10% in China. And the UN has estimated that an increase in global temperatures of 2°C would knock up to 2% off global GDP by the middle of the century. Thus, the world should come to grips with the known costs of climate mitigation now, than try to grapple with the unknown but certainly spiraling costs later.